The first IPOPI Vietnamese PID Patients-Doctors National Meeting was a great success and culminated with the agreement to launch a patient group. 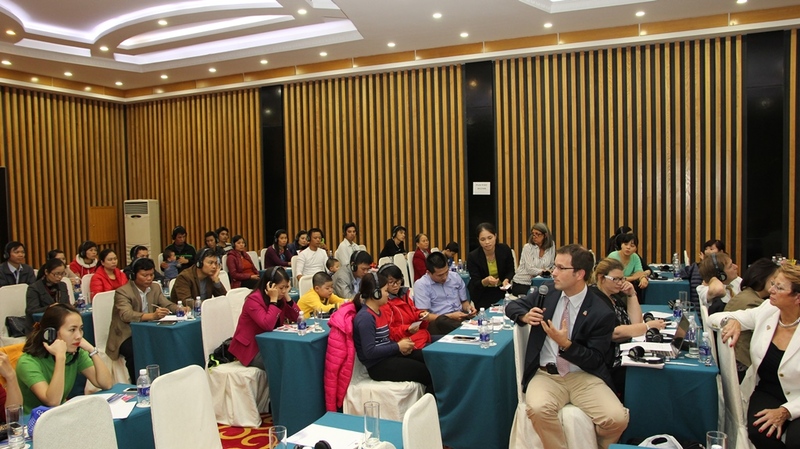 Over 80 participants from various regions in Vietnam including patients, family members, doctors, the Vietnamese Haemophilia Society and guest lecturers from The Netherlands and Thailand were in attendance. The event received good media attention with a 20 minute TV report being aired. 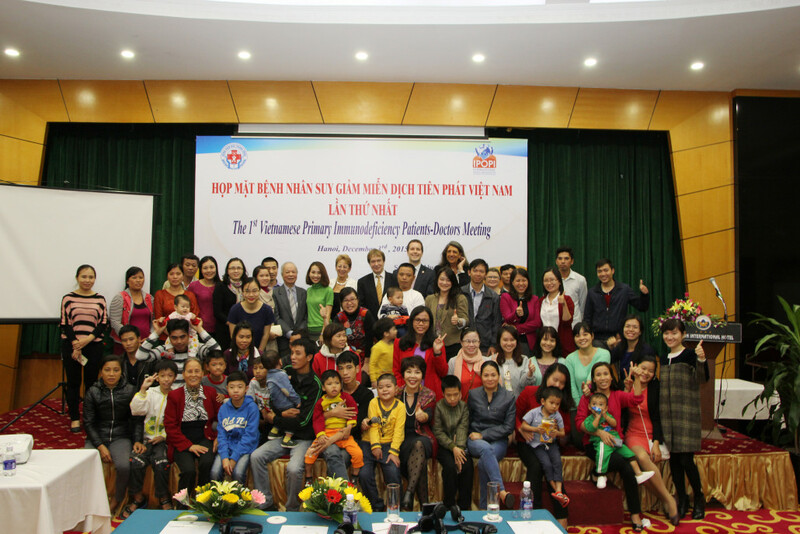 The first IPOPI Vietnamese PID Patients-Doctors National Meeting meeting was organised in collaboration with the National Paediatrics Hospital in Hanoi and the Vietnamese Paediatrics Association and took place at the Baoson Hotel on Thursday 3rd December 2015. After a welcome address by Prof Lê Thị Minh Huong (Hanoi National Paediatrics Hospital), Prof Nguyen Cong Khanh (Vietnamese Paediatrics Association) and Jose Drabwell (IPOPI President) the meeting started with a scientific session. Prof Van Hagen (IPOPI MAP Member, Netherlands and Thailand) first provided a presentation on “The immune system and PIDs” designed to provide an overview to the patients and families in attendance. The presentation described the basic function and various components of the innate immune system and the adaptive immune system, including the role of T-cells, B-cells and cytokines. Dr Narissara Suratannon (Dr “May”, Thailand’s Chulalongkorn University Hospital) then followed with a most interesting presentation reviewing the progress of the Thai patient organisation (ThaiPOPI) since their creation and the work of SEAPID, the South East Asian Network of Experts on PID launched earlier this year in Bangkok with the support of IPOPI and the Care-for-Rare Foundation. She stated “ThaiPOPI was created at the initiative of IPOPI who you will realize after today will become your very good friends moving forward”. Prof Lê Thị Minh Huong then talked about the PID experience in Vietnam going over the key challenges faced by patients and doctors but also outlying the great progress made in the last five years going from 2 diagnosed cases to 73. She expressed her wish to found “VietPOPI” so that Vietnamese patients with PID can have the support they deserve. The patients’ session first featured a presentation by Mr Johan Prévot (IPOPI Executive Director) who provided an overview of IPOPI’s activities and support programmes available to help NMOs with their national campaigns and actions. He stressed the great milestones recently achieved in South East Asia through the IPOPI Bob Le Bien Asian development programme with the launch of new NMOs in Malaysia, Thailand, Hong Kong, and more recently Singapore and Indonesia where new patient groups are currently being formed. The creation of SEAPID at the meeting which IPOPI co-organized with the Care-for-Rare Foundation in Bangkok in early 2015 and the South-East-Asian Call for Action was highlighted as a key development for the region. Dr Nguyen Hoang Nam (Vietnamese Haemophilia Society) followed with a presentation outlining the experience of the haemophilia patient organisation in Vietnam. The society was established in 2007 and is led by a Board of Directors made up of 9 doctors and 4 patients. Currently the society has 1000 members and regional branches established in the different regions. During the discussion that followed families of PID patients expressed their concerns about the future of their children with school integration issues and stigmatization of the patients having been noticed. All families are worried about the continuity of the treatment after the age of 18 as replacement therapy is only covered for children. Many patients live outside urban areas and have to travel long distances to get treatment and sometimes also in between treatment if any complications arise. There was a unanimous agreement between the patients and the doctors that a national patient organisation should be launched as soon as possible. Some of the patients in attendance indicated their willingness to take part and contribute to the patient organisation. Bui Huong Giang, mother of a young boy provided a very good overview of the situation in the country was indicated a possible future chairperson. The meeting was organised with the invaluable support of Kedrion and as part of the IPOPI Bob Le Bien Asian Development Programme.